LAS VEGAS – Intel Corp. is pushing a new set of standards that laptop manufacturers can reach for, focusing on improving the user experience around performance, battery life, and connectivity, and the first devices touting the “Project Athena” brand will be out in the second half of 2019. Announced at CES 2019, Intel compared the new initiative to that of its Ultrabook specification debuted in 2011. Where Ultrabooks challenged laptop manufacturers that use Intel CPUs to improve the form factors of their devices, Athena will focus on user experience. Ultrabook specs required laptop makers to come in under a specific thickness depending on screen size, meet certain standards for battery life, and have certain connectivity features such as USB 3.0 and wireless display support. In exchange for meeting those standards, manufacturers could use the Ultrabook branding in their marketing materials. Eight years after those were introduced, laptops in 2019 are improved for the effort, as the days of toting around a hefty slab of plastic and silicon seem a distant memory. How exactly Athena will improve upon laptops yet again isn’t clear. At CES 2019, Intel unveiled a list of partners that will support the new standard and announced that it will be featured on both Windows and Chrome operating systems. Intel says that while partners understand what the specifications are, they are not available publicly yet. In an interview inside Intel’s booth on the show floor, Ran Senderovitz, vice-president and general manager of retail and wireless gateways for Intel Corp., hinted the specifications could require connectivity with wireless standards such as Wi-Fi 6 this year, and with 5G standards in the future. Other aims for the project include battery life that is improved to the point that laptop users feel comfortable leaving their power cord at home, Senderovitz adds. But to maintain a certain performance standard as well. The specs for Athena are based on consumer research that Intel conducted, identifying the main pain points around using laptops today. Intel isn’t sharing all of that research, but it says the broad strokes of it indicate that people use their PCs when they want to focus on a task and get work done. They want their PCs to be “always-ready” and “adaptive.” Some sort of artificial intelligence features will also be included on Athena-brand laptops. Dell is one of the laptop makers committed to the new project, as it was with Intel’s Ultrabook initiative. While no laptops on the market are branded with the “Athena” label, the just-announced Dell Latitude 7400 2-in-1 device is compliant with the specifications, according to Rahul Tikoo, vice-president of commercial client mobility for Dell. Dell’s Latitude laptops, and its other higher-end lines, could announce a Project Athena branded release later this year, Tikoo says. Athena was an important Goddess for the Greeks and among other things, was considered the goddess of inspiration. 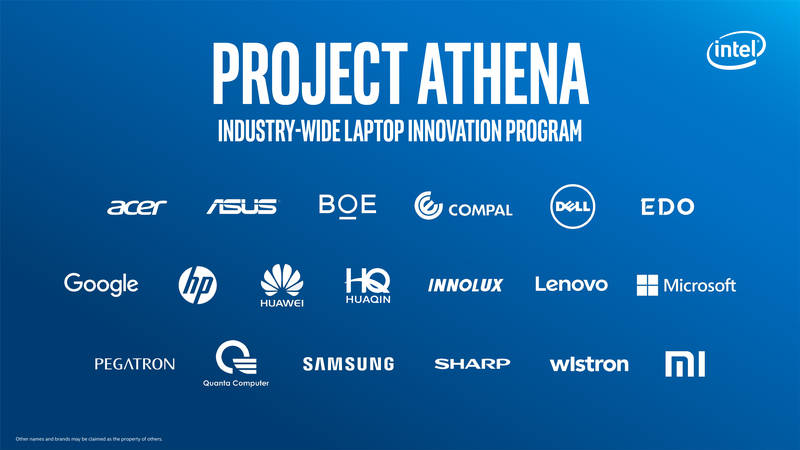 With Project Athena, Intel hopes to inspire another step up in the laptop experience, as Ultrabook did for the past several years. With notes from Alex Coop. Brian Jackson’s travel and accommodation expenses related to CES 2019 were paid for by Intel Corp. Intel did not review this content before it was published.